Annual Form 700 filings are due to the San Benito County Clerk's office no later than 5:00pm today. Annual Filings cover the period between January 1, 2018 or your most recent filing (whichever is later) and December 31, 2018. Access our Form 700 Online Filing System Here. 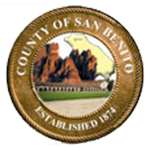 Annual Form 700 filings are due to the San Benito County Clerk's office no later than 4:00pm today. Annual Filings cover the period between January 1, 2017 or your most recent filing (whichever is later) and December 31, 2017.